Left, a detail of one of Packwood's original tapestries, and, above, our re-creation using vegetable dyes. 17 June Alison Daykin "Design for the Terrified"
21 Oct Michala Gyetvai "Felt Art"
Thirteen Guild members and two visitors from Birmingham Guild met at the College armed with our wheels, big bags of all sorts of yarn, beads and threads and with a photo to give us inspiration. Alison encouraged us to write a short piece about why we chose that one and then gave us ideas as to how we could give a feeling of it in our spun yarn. She showed us how to make slubs and give texture and how to introduce small cut pieces of interesting colour into our spun yarn. There was a lot of to’ing and fro’ing as we helped ourselves from one another’s stashes. The room buzzed with enthusiasm and we were all delighted and surprised with our results. It was a wonderfully sociable day and Alison was a superb and inspirational teacher and encouraged us to think 'outside the box'. More photos of the spinning workshop – Click here! The weather was kind ensuring another magic day at the home of Mark and Angela Tilley. Teresinha was busy with both cochineal and woad vats and good results were achieved following her written instructions. Most of us went home with skeins, fleece and other items which had been transformed by the process involving natural dyes. Those of us who were at Mark and Angela's a few months ago may remember hearing a cuckoo, this time the special effects were provided by a vintage aircraft which flew fairly low over their garden where we were sitting enjoying the sunshine. Lots of Guild members came and we had an exciting and inspiring evening. Sarah has been knitting for a long time, often starting with a basic pattern but using different yarn, different size needles, creating her own designs along the way and ending up with something unique. She showed us a whole range of garments, hats, scarves and shawls dyed with natural dyes which she had designed and made over a number of years. There was something to inspire us all to try something different. The skiing hat with the dreadlocks has certainly made my fingers itch to start knitting. We all had a super evening. Teresinha started by describing to us how plant fibres had been used since ancient times to produce many items including textiles, baskets, ropes and paper. She showed us examples of the commonly used fibres such as flax, cotton and hemp and explained how the fibres were produced and used. Teresinha also told us about a range of more unusual fibres used to make cloth such as nettle, abaca (a type of banana) and pina (pineapple). She had experimented with nettles and showed us the results of the experiments. Towards the end of her talk she showed us examples of some of the newer plant fibres available for spinning and other textile work. 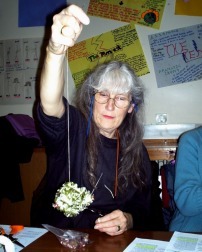 Her talk was well illustrated with lots of samples of the fibres and with articles made from them. Good turn out for the Guild last night. Zarena came. Jane Lucas and Sue both showed their spinning. Luckily Jane had just brought back the guild wheel or we wouldn't have had one there. 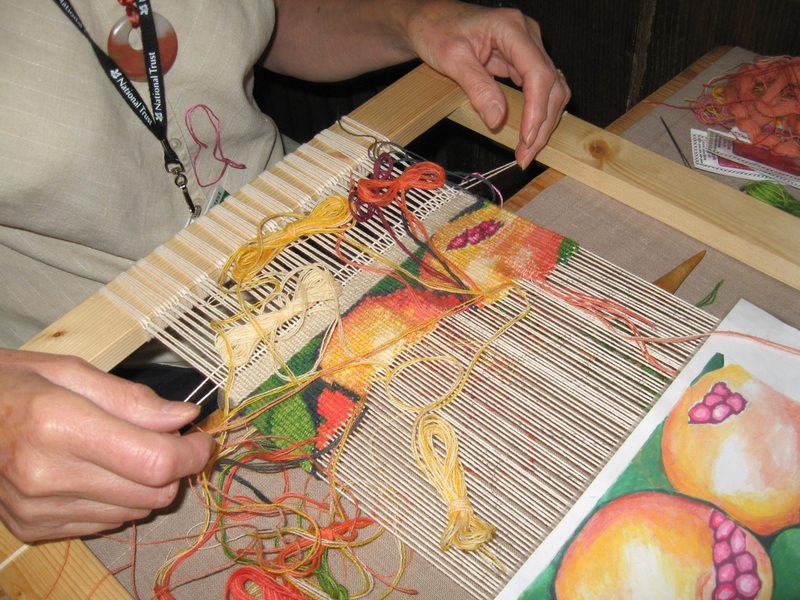 We had peglooms, drop spindles, needle felting and Ann and Ros were doing very clever things with tablet weaving. We appoint officers and committee to run the Guild at the AGM. If you are new to the guild, do think about joining the committee. We aim not to have meetings just for the sake of it. 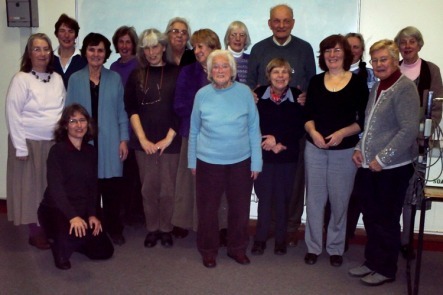 In 2008 we only had three committee meetings and still managed to get everything done. Our AGMs are always fun and if you have anything you have made or an interesting Xmas present to do with our crafts, do bring it along to show. If you have any finished coiled baskets, it would be nice to see them. NEW! Photos of the Coiled Baskets & Xmas Party - click here! 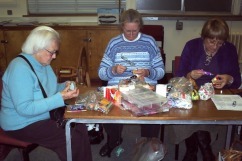 Angela led a workshop making fluffy balls or pompoms. This is part of a worldwide scheme developed by Amy Larne from Northern Ireland to help towards world peace. The pompoms will go on to take part of the world’s biggest collection of pompoms for peace. We had a lovely time sharing out our washing lines for the core of the baskets, sorting the wool and then finding the right needle to sew with. Some people were very quick to learn how to hold the line and to wind the wool with a threaded needle, others took much longer, but I think everyone managed to learn the basics. It was certainly a very enjoyable evening. NEW! Photos from the Paper-making Day - 19 July - click here! Angela Tilley and her husband Mark were our hosts and we enjoyed the use of their home and garden, as well as a generous supply of cups of tea and coffee. 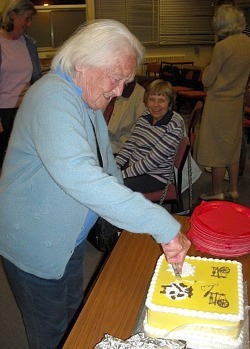 The day started with the sad news that our dear friend Betty Davies had passed away the previous evening. A lot of preparatory work had been done, e.g. shredded paper had been put through a liquidiser and the remains of a previous dyeing session provided some of the colours. There were thirteen guild members present and Teresinha soon had us all enthusiastically making paper. There were several bowls of murky looking liquid into which we dipped frames and scooped up some goo. Draining the frames only took a minute or two and then the contents were pressed between J-cloths; the end results were sheets of attractive paper. Some members had brought along petals, coloured thread and silk, all of which helped to make each sheet of paper unique. We really do owe Teresinha a huge debt of gratitude; she not only shares her knowledge with us but also gives us encouragement and advice. After lunch Teresinha’s husband Mike arrived and took photographs of several members who were dipping frames, pressing the water out of their work or hammering cooked iris leaves which turned into a pulp and which we all used to make even more paper. In my book, days don’t come much happier than this and I am sure that if Betty was with us in spirit she would agree. NEW! Photos from the Hatton Demonstration Days - 14 June - click here! Melvyn Thompson from the Carpet Museum Trust in Kidderminster came to speak about oriental pile carpets. As well as an outline of the history of carpets in the Middle East, India and China and a description of the knots used, he entertained us with stories of his holidays searching for contemporary carpet makers. After many years in the weaving factories of Kidderminster he had decided to try hand-knotting a rug himself and brought it, still on the loom, for us to see and try out a knot ourselves if we wished. It is a long term project particularly as he in now very involved in setting up the new Museum in Kidderminster, working on the fund-raising and demonstrating at the temporary museum which is open in the summer. Several of us are planning a visit one Saturday. We made some very elaborate Xmas decorations, similar to Japanese temari, using folded cardboard, yarns, pins and glue. It was interesting to see how they all looked quite different, from colourful decorations using hairy thread to delicate pastel ones made with fine embroidery thread. Many thanks to Audrey for making all the templates. The food was just as varied and good, we ate sweetcorn fritters, grapes, bakewell tart and much more, accompanied by Ann’s delicious fruit punch. Saturday meeting at Angela Tilley's house. We plan to make paper with shreddings dyed with the exhaust baths from the dyeing we did last year.